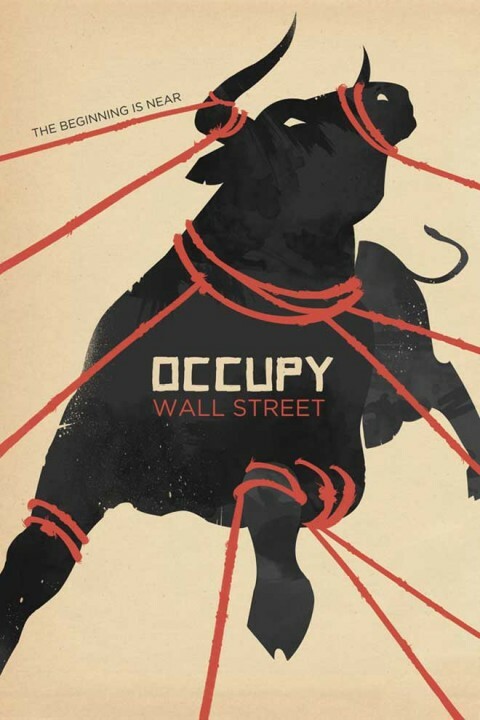 Occupy Wall Street and the global Occupy Movement have inspired some striking artwork. Graphic artists from around the world (including Shepard Fairey mentioned here earlier today) have contributed their talents to the movement. 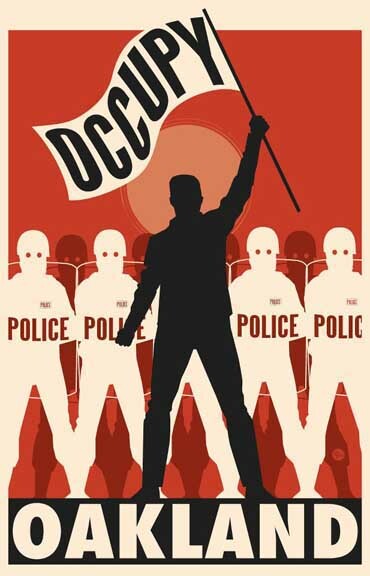 Many of their posters are available for free or at low cost, either directly from the artist or through organizations like Occuprint and OccupyTogether. You can post them in your town. New Yorker cover artist and book illustrator Eric Drooker has created several beautiful posters, including the one above. You can download a high-resolution copy suitable for printing at OccupyTogether.org. 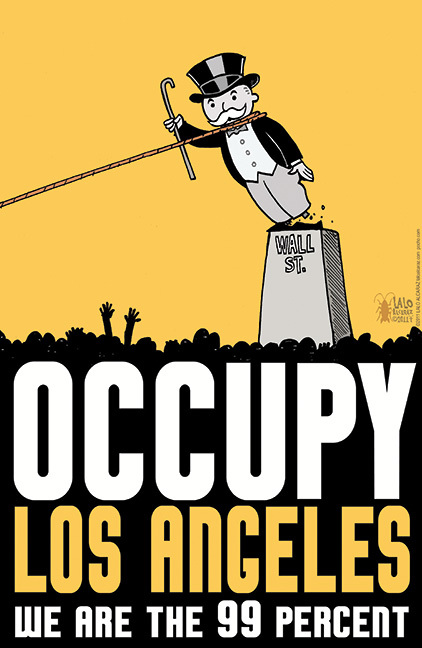 The noted Los Angeles graphic artist, cartoonist and radio personality Lalo Alcaraz created this parody of the toppling of the Saddam Hussein statue in Baghdad for Occupy Los Angeles. In a message on his website, Alcaraz invites people to distribute the image. Alexandra Clotfelter is a student of advertising design and illustration at the Savannah College of Art and Design in Georgia. Since donating her design, "The Beginning is Near," to Occuprint.org, it has become one of the most popular posters to emerge from the movement. In response to requests, Clotfelter is offering a high-quality Giclee print for sale, with a portion of the profits going to support Occuprint's project of distributing free posters worldwide. In this poster, Zucotti Park is portrayed as the "Tip of the Iceberg." Indeed, the Occupy movement extends to places like Lawrence, Kansas, where muralist, printmaker and writer Dave Loewenstein is based. Loewenstein's design is available for free at Occuprint.org. 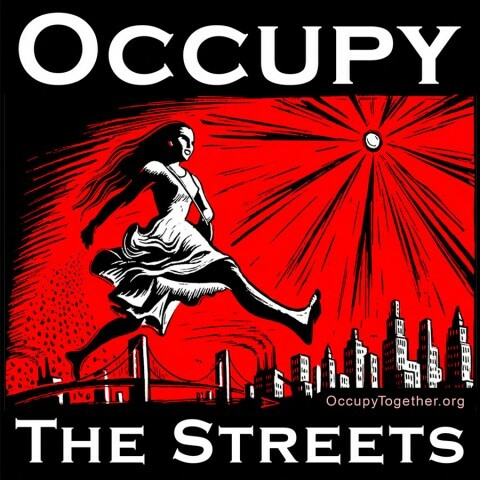 Poster artist Rich Black of Berkeley, California created this image for Occupy Oakland. It's available for free download at Occuprint.org. To see a variety of Occupy posters by other artists (and to download them for free) you can visit Occuprint.org and OccupyTogether.org. 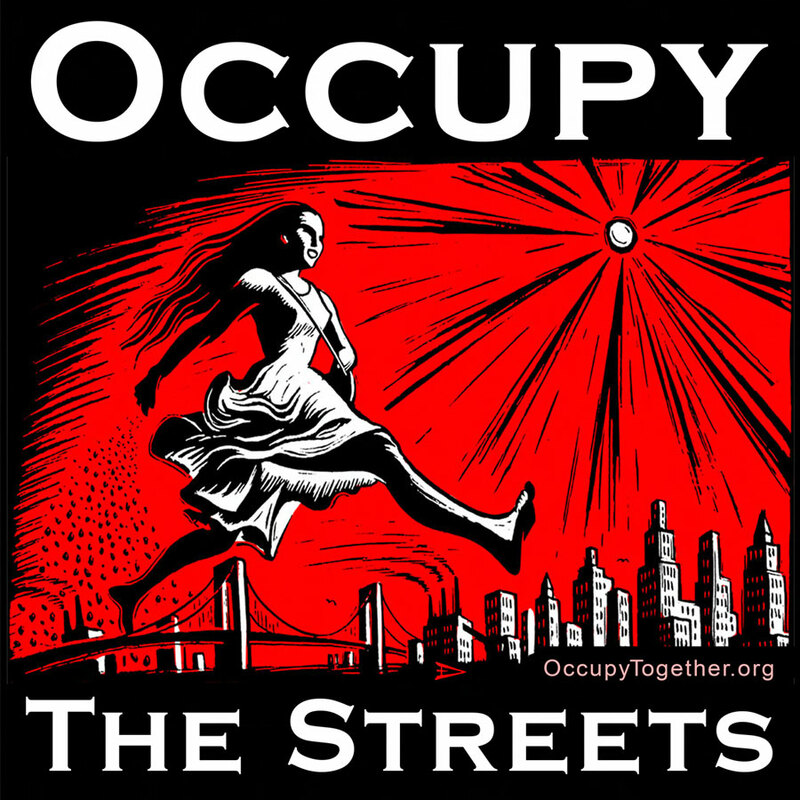 And don't miss our post earlier today: Shepard Fairey Caves In, Revises Occupy Wall Street Poster. Not a fan of the Fairey print, but these I love. Kottke (I think) commented once that the “Inside the Loop” movie poster recalled the way movie posters used to look in the Golden Age of Hollywood – simple, schematic with a clear message. Maybe someone in the OWS movement is also a fan of that aesthetic. Perhaps the “occupiers” could come up with some cogent policy proposals. (“I am angry because that guy has more than me” doesn’t cut it.) When they accomplish that, they might be able to create some posters that actually convey a message. Love all of the posters!! @Hanoch the OWS movement isn’t “angry because that guy has more than me”. We are angry because of the way these guys got what they have! I got the message the first day! I don’t understand how some people don’t get this. Maybe some want to just act like they don’t get it! Ppl like Hanoch miss the point of the movement. It’s not about crafting “cogent policy proposals,” there are PLENTY of them available that have repeatedly and consistently ignored by the 1% because they control the means to do so. The movement is far more about the OUTRAGE that the 1% have turned into blatant, coldblooded, greedy assholes who care nothing for the principles they espouse day after day as they prop up their puppets in our government. Get a clue, Hanoch, we’re telling folks we’re tired of having our cogent policy proposals ignored, and we’re tired of being trampled under the jackboots of an increasingly militaristic police state that is more interested in protecting and furthering the status quo than it is in serving a true democracy. You are witnessing the beginning of a revolution, sir, THAT is what these posters are expressing. Well spoken, SolidarityDriven. “Cogent policy proposals…” Hmmm. How about an example? How about the college debt racket? The way the current system runs, you can’t expect to really get anywhere without that college degree the are more often than not paid for by Freddie Mac or Fannie Mae at 8% while they the USG sells the loan to these THUGS at 1%. Oh and by the way, if you get in over your head? You can’t be bailed out like certain 1% Fortune 500 companies…Funny how belly up companies claim the rights and civility of people and thus can claim bankruptcy, but a student who gets caught in a mess of debt? Sorry, charlie. No, nobody forced the student to take on the debt. That’s true…until you are two years in to college and you HAVE to pay for the rest if you want to finish. Solidarity, unity, trust, and loyalty joined to the conviction of the truth and justice of this cause will keep it alive. We mustn’t permit the forces of cynicism or powerlessness undermine what has revealed itself as the true spirit of the people, not only of this nation, but of the world in one cause. Fairness and justice will bring the peace we’ve sought vainly in force. @SolidarityDriven: I do not subscribe to despising others because they have more than I. Whether an individual is worthy of contempt has nothing to do with his or her wealth. Many who currently fall within the top 1% in annual income — and that group is fluid and changes constantly — are hard working and admirable people. That includes people who work in finance. Ironically, the type of hate-filled and irresponsible language you use to baselessly blanket entire groups of people with immoral conduct is exactly the way the real thugs in “jackboots” have caused so much misery throughout history. @hanoch agreed not everyone should be painted with the same brush. So let those principled 1%er stand up and use their influence to bring human rights and social inequality to the forefront of what has become a violent and unfriendly cycle of poverty for too many. @Morgan: I’ve got a better idea. How about 100% of us stand up and use the resources we have to make the world a more decent place. One place to start would be to stop worrying about what the other guy is or is not doing, and worry about what we are doing. Imagine if all the people wasting their time “protesting” actually woke up in the morning and decided they were going to use that time to actually do something positive for someone else. Hanoch, you are a useful idiot. is through protest. Protest aimed at those who control the resources and the system. You’ve tied yourself in a neat circular knot, simply by saying your protest is 1% different from theirs means nothing. I think some of the problem is the people who think they are part of the 1% and feel they are being attacked by the 99%. In reality unless you own like 10 homes, have a warehouse full of cars, a bank account in the billions you are misunderstanding the battle that is being fought and feeling wrongfully offended. It is almost unfathomable to understand being THAT wealthy. Those Really Really wealthy groups of people that control the wealth play monopoly with all of us, including you. They pocket the money of hardworking Americans (mostly 99%ers) and distribute it not. They encourage us and expect us to spend our money for capitalisms sake, however the wealth they have attained stays put, not being put fairly into the market and in fact many loopholes are created so they don’t have to pay ample taxes, fees, and other fair percentage of their money to go into the maintenance of our country-whatever that might be. This protest is about fairness, equality, justice, and no one company or person being above the laws of the people.